Princess & the Paper presented by A Jillian Vance Design: Happy Birthday Pam! Hey everybody! Today is a very special day ~ not just because it is Valentine's Day but because it's one of our design team members' birthday! Happy Birthday Pam at Pam's Purple Loft! Since Pam's favorite color is purple, my mom and I decided to make cards with purple on them. I'm actually in love with the one that I made! 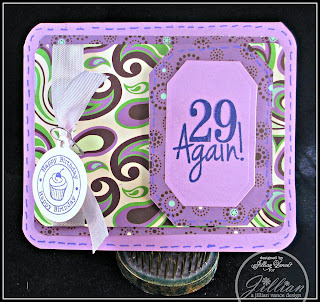 Thanks for stopping by today and please go to Pam's blog: Pam's Purple Loft and leave her some Birthday Wishes! Thank You SO Much.....IT'S BEAUTIFUL! !